Leaving Durango, we took a little dip south to make a quick stop at Four Corners National Monument before heading onwards to Utah. With a whopping seven votes, we couldn't pass it by. The people had spoken and they wanted us to be in four places at once. While driving away from Durango, I don't think we quite realized that we would be trading the lush green mountains and chilly nights of Colorado for hot, dry desert until we were surrounded by the sunburnt, parched land of Colorado's southwestern corner. After our month-long stint in the deserts of West Texas and New Mexico, we weren't exactly looking forward to the dust, the stifling heat that never seemed to dissipate or the unforgiving sun beating down on our aluminum tube. 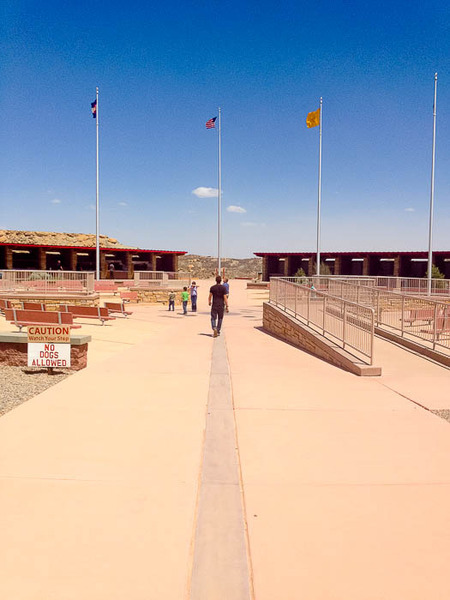 After driving through the dusty empty desert, we pulled into Four Corners, paid our three dollar admission and parked B.B. and Loretta along the outskirts of the uneven parking lot. 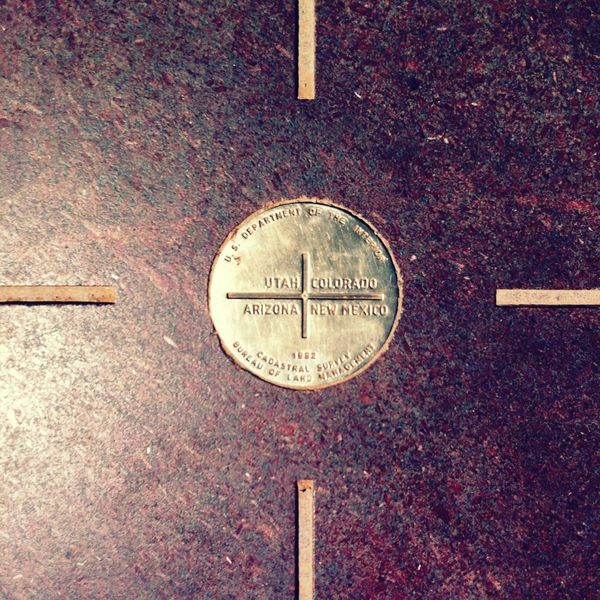 The monument consists of a circular plaque on the ground at the supposed point where Colorado, Utah, Arizona and New Mexico meet. 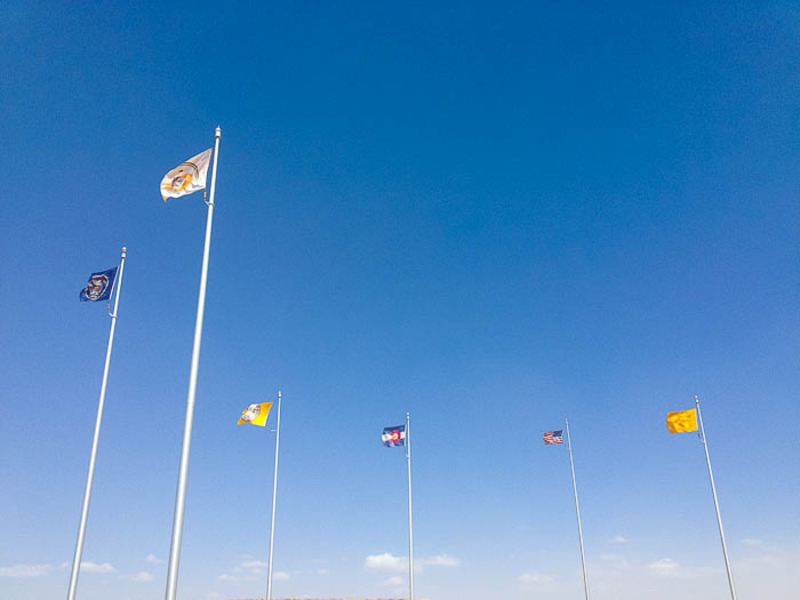 Flags of each state proudly fly on the their home ground and the whole thing is enclosed by rows of booths set up for the local Native Americans to sell jewelry, arrowheads and other handmade trinkets. Four Corners is one of those places that may be better in theory than in actuality. Being in four places at once sounds awesome. How often do you get to stand with each limb in a different state? It's one of those experiences you can proudly cross of your bucket list, something you can say that you did. But the reality of it was much more depressing. Because Four Corners falls within the jurisdiction of the Navajo Nation, the monument is maintained and run by the local Native Americans. They rely on us tourists to spend money on their handmade souvenirs in order to earn a living. No shame in that, but we felt the dark cloud of "white guilt" looming over us. We did our best to convey a heart-felt "sorry our ancestors really screwed you guys over, but we don't have any money to spend" look, which (I would be so bold to assume) was probably the most sincere condolence they had received all day. 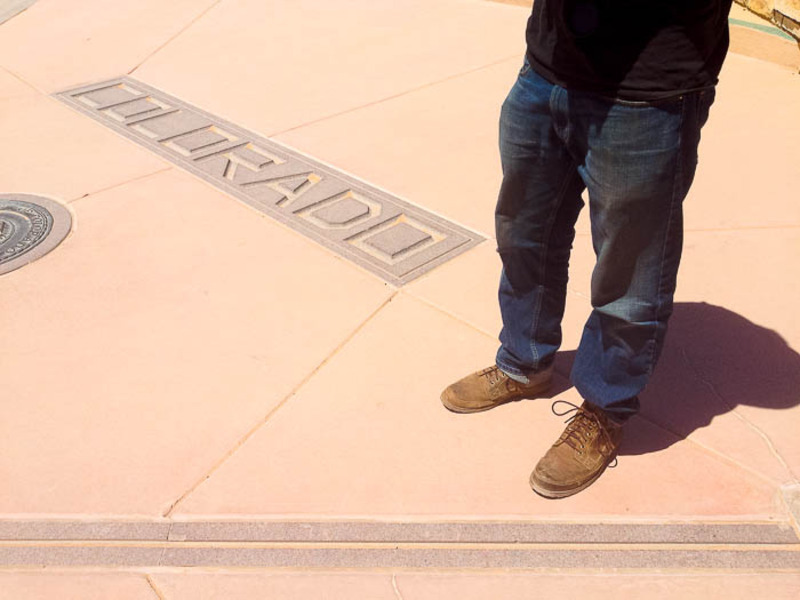 After seeing what we went to Four Corners to see, we gladly continued onwards to Utah. While being able to cross off "being in four states at once" from our bucket list, the awkward obligation we felt to reparate for our forefather's crimes against humanity left a bad taste in our mouths. Special thanks to Olivia D. (who suggested be in 4 places at once!) for making this blog post possible!